Yeah its Friday!!!!! 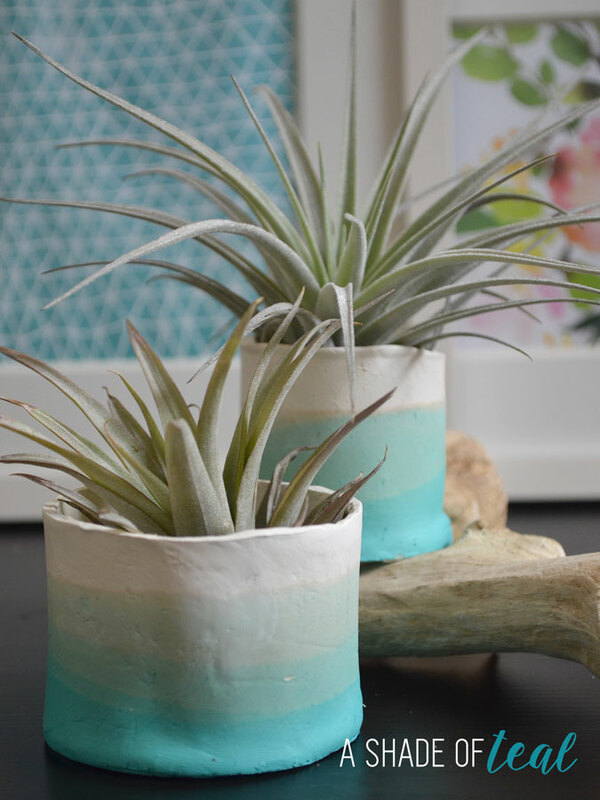 I made these awesome Teal ombre clay pots awhile ago and you may have seen them in several of my decor pics, but today I’ll finally share the tutorial. 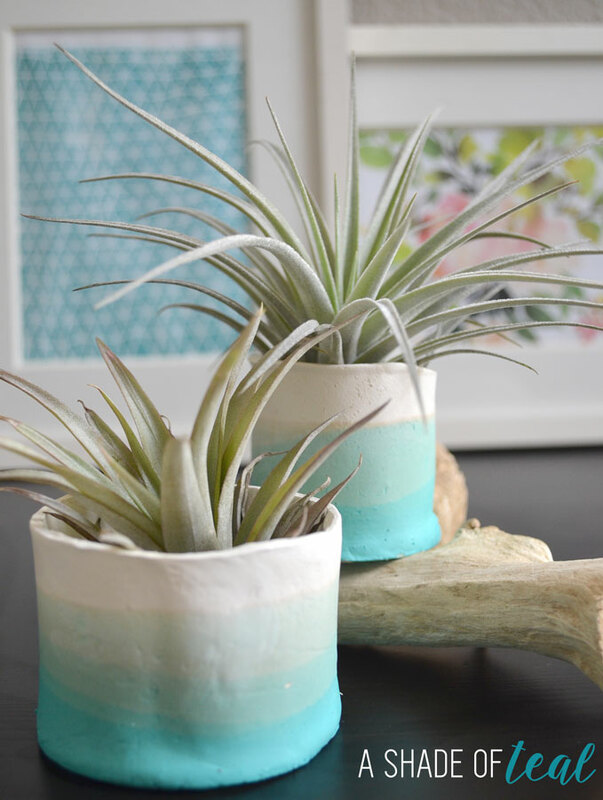 I love them so much, you can display air plants or mini succulents, or even use them as a pencil holder. So many possibles with these guys! First things first you’ll need air dry clay, I used Crayola brand. 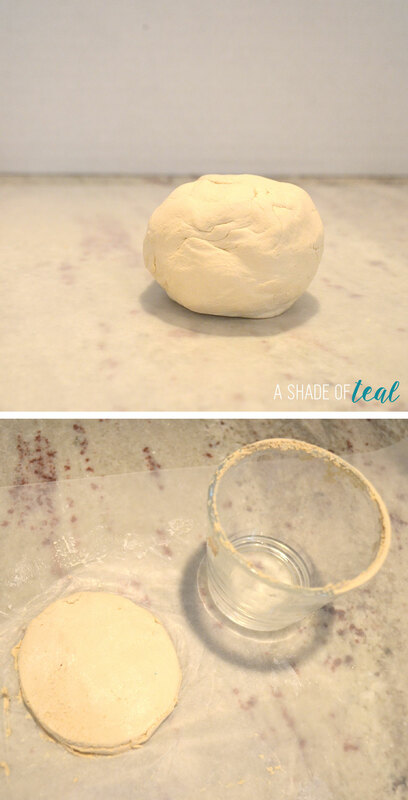 You’ll then need to take a good amount and spread it out using a rolling pin. 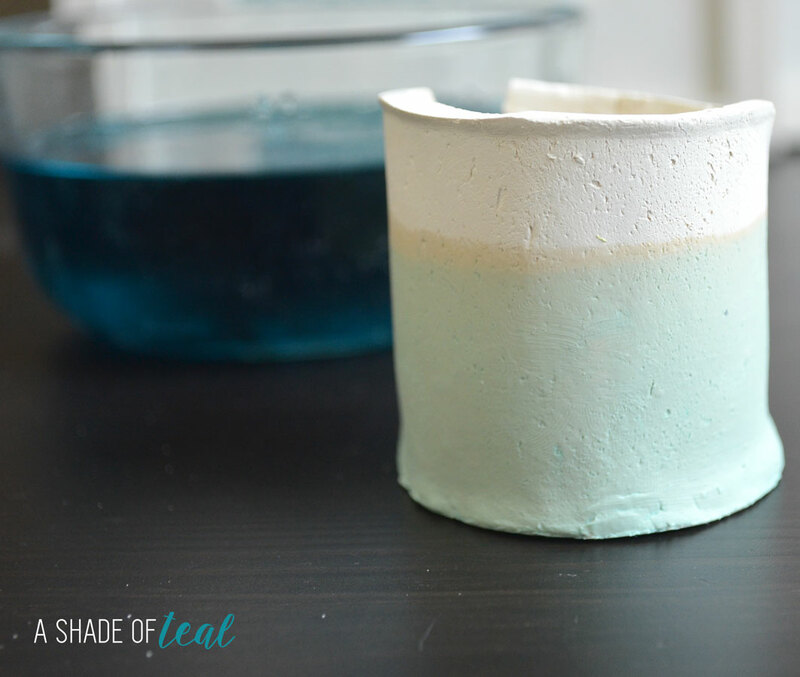 Then I used this old candle holder to cut a perfect circle out of the clay, this will become your base. You can also use a glass/plastic cup. Next roll more clay out and cut it in the shape of a rectangle. 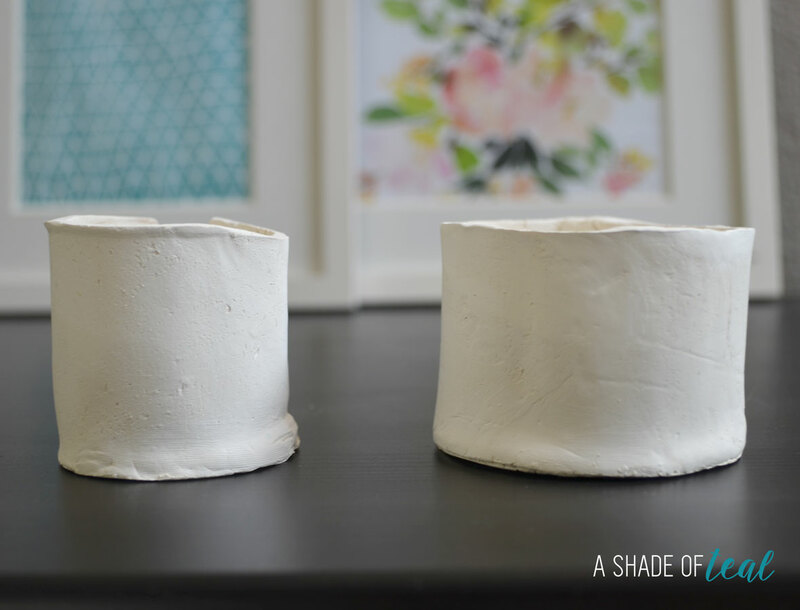 It will need to be about 1/4″ thick and make it long enough to wrap around the circle you created. Mine was about 9″ long and 3″ tall. You can measure around the cup, or in my case the candle holder to get a idea how long you need to make it. Next, start wrapping the clay around the base. 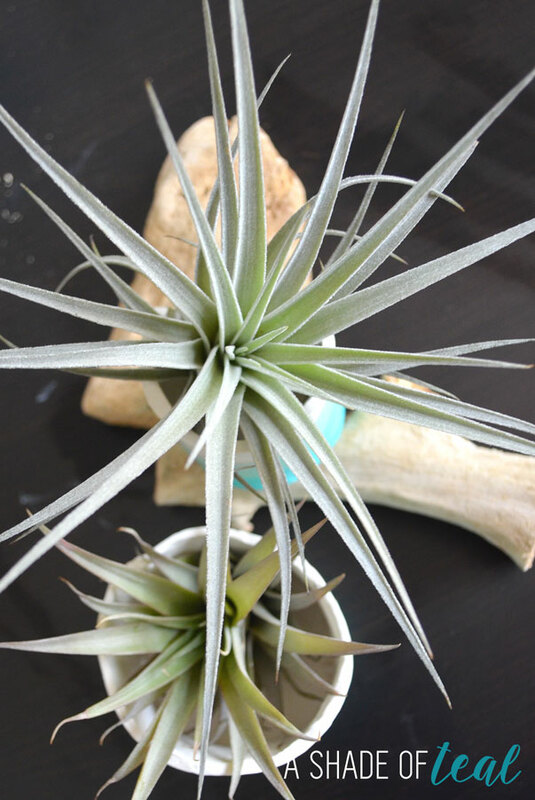 Using a little bit of water helps it stick together. It won’t be perfect, but keep working with it till you get it how you like it. Now where it connects you’ll want to use water on your fingers to smooth out the seam. You can see I didn’t care as much about the inside seam since a plant would be covering that up. I then made another and let them both dry for about 24 hours. 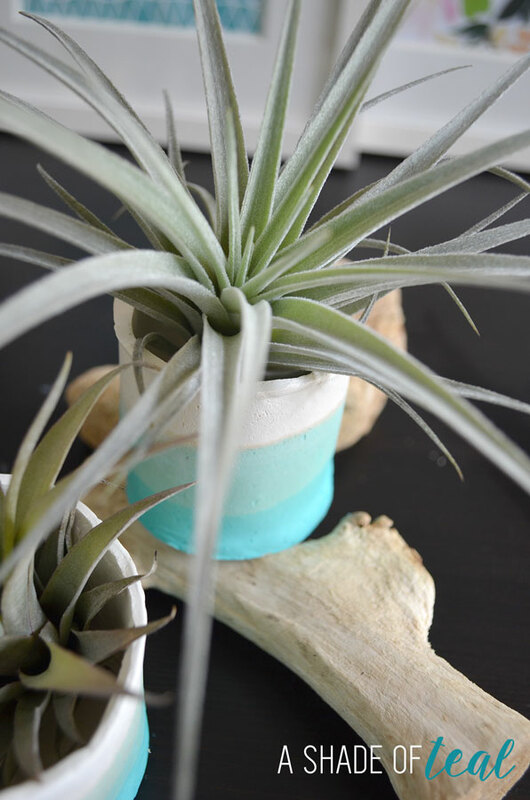 Once dry, you can use a nail file to smooth out the top edges. Or even a little more water works as well. Now for the fun part! 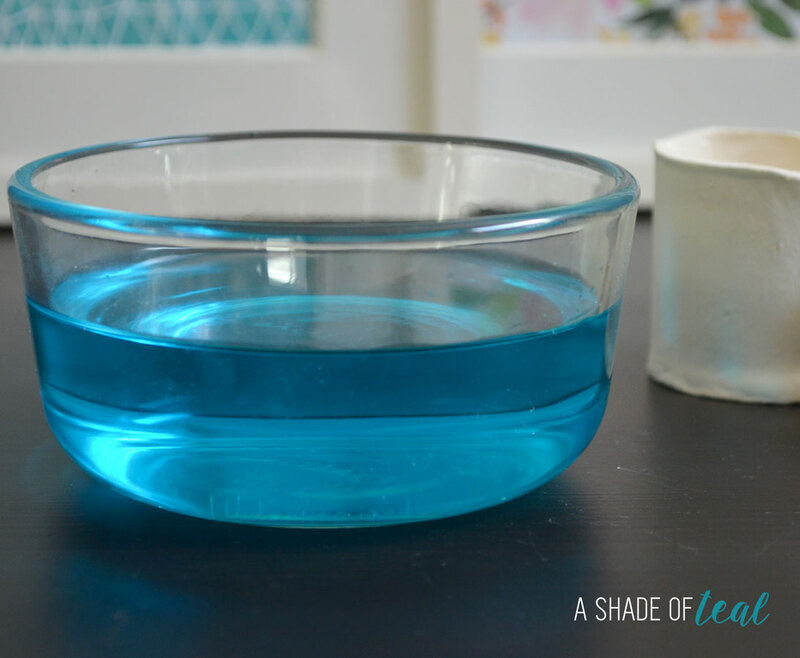 You’ll need a bowl of water and some food coloring. You can obviously use whatever color you like, but of course I love Teal so that was my choice. 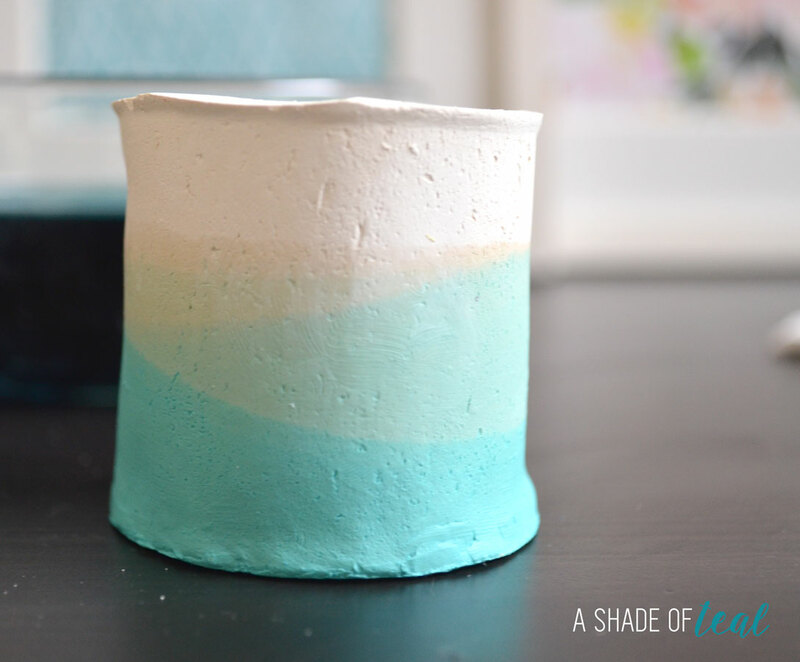 I dipped my clay pot 3 times, so the first round needs to be a light teal. Then take the clay pot and hold it in trying not to move it for a couple seconds. This is how it looked after I took it out. 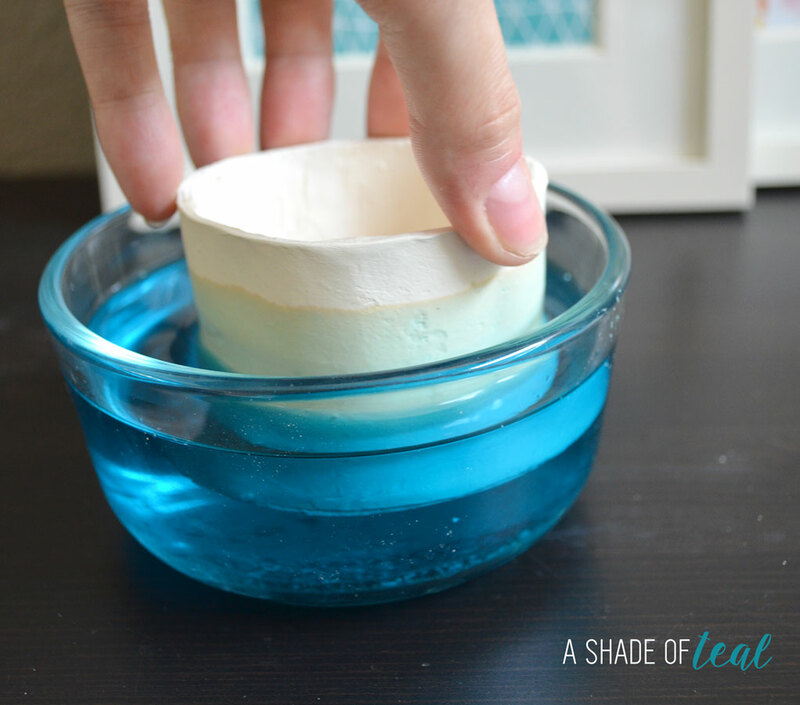 Keep in mind that air dry clay doesn’t like water so leaving it too long in the water will make it soft. 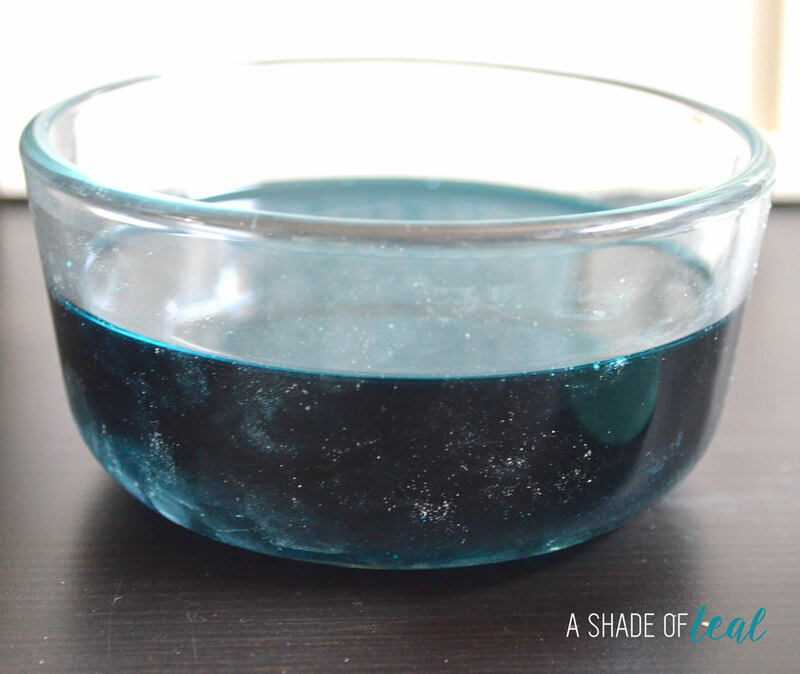 Now make the same water darker by adding a couple more drops. Then you’ll need to dip the pot but don’t put it as deep in the water. 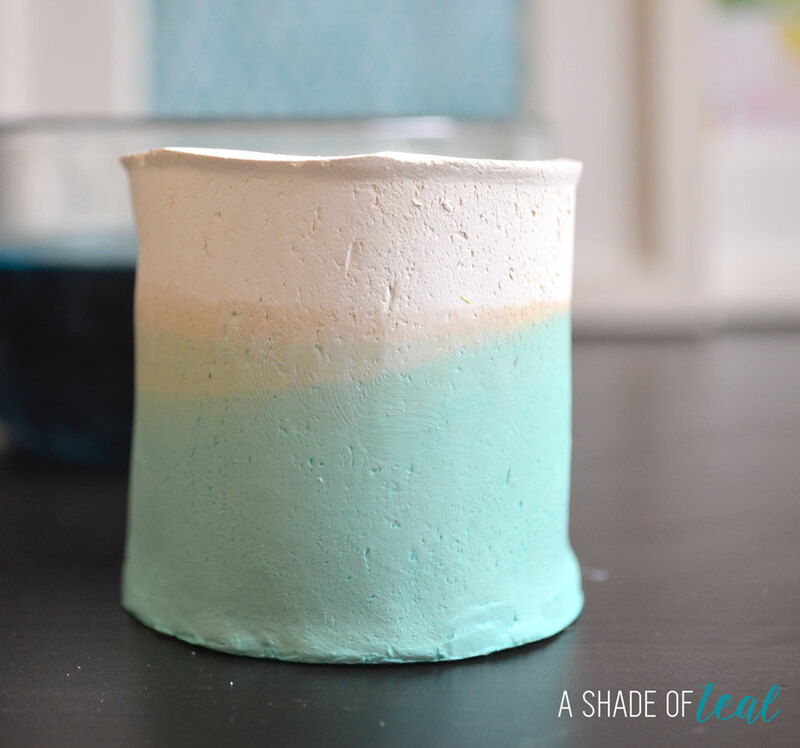 This will create the Ombre look. For round 3 add a couple more drops. You’ll want this to be the darkest water. Then dip again. You can see I dipped each time at a different angle to get a different look. That’s it! Let them dry for a little bit and their ready to use! You can see I didn’t let mine dry all the way before I put them to use. I was so excited how they turned out so I couldn’t wait! 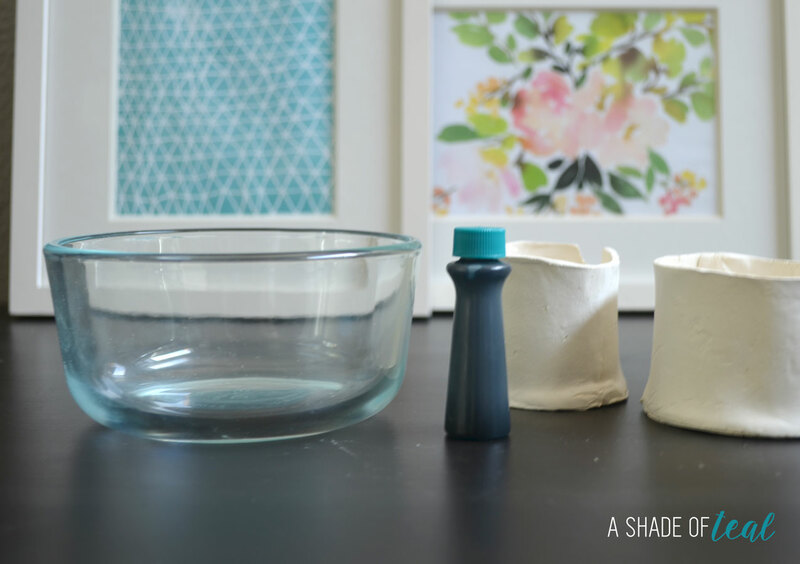 Here’s another place I used these same Ombre Pots, DIY- Geo Wine Rack to Shelf. 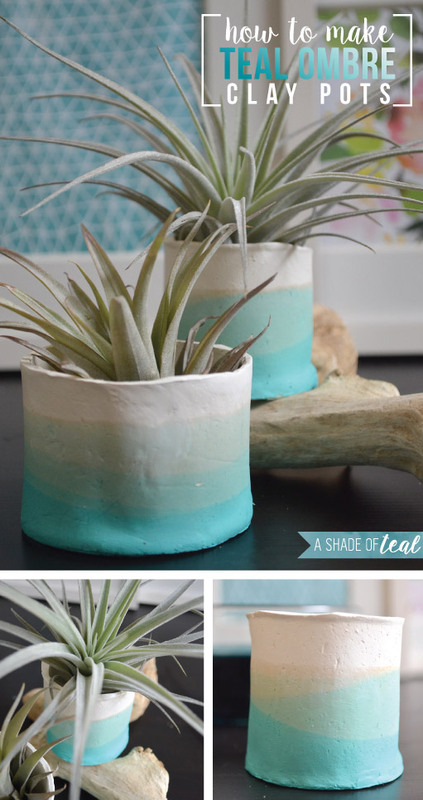 If you like this project also check out How to make Geometric clay pots. These are amazing! 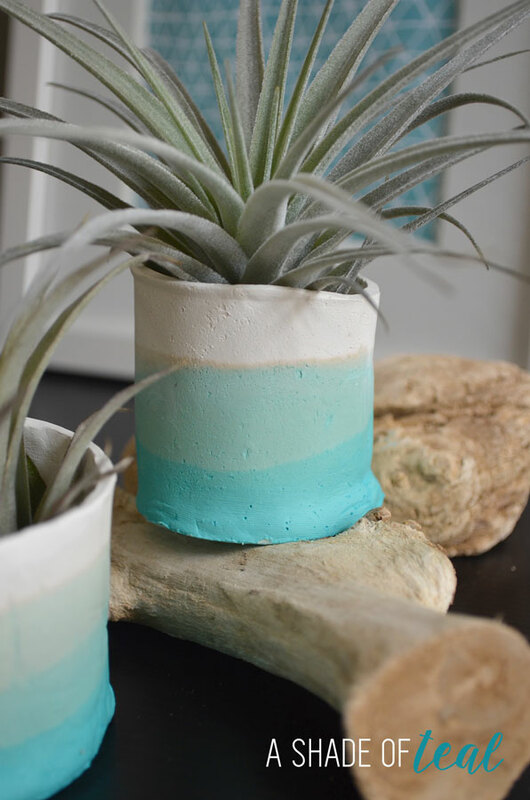 I have to add this to my long list of DIYs. And I of course love the colors!!! Thanks Crystal, I know what you mean my DIY project list is way too long! LOOOOOOVE THIS! I am going to try and make at least one when I get back from vacation! Thanks for sharing! Oh my gosh this is amazing! I must copy! I love this! I just redid my house in light gray and my highlights/color spots/accents are all teal! This is my fave color, too. I now have lots of idea running around my brain, thank you! Love this idea! Absolutely beautiful. Do you recommend sealing them with anything?